The college was awarded ISO 9001:2000 certificate in the year 2004 by British Standards Institution. This was a pioneering achievement in the educational circle. Received Permanent Affiliation from JNT University Anantapuramu. The college accredited by National Board of Accreditation in the year 2012 for ECE, CSE,EEE and IT branches. The college was awarded ISO 9001:2008 certificate in the year 2012 by TUV NORD India Private Ltd. This is a pioneering achievement in the educational circle. Received grant from AICTE and established IIP Cell. 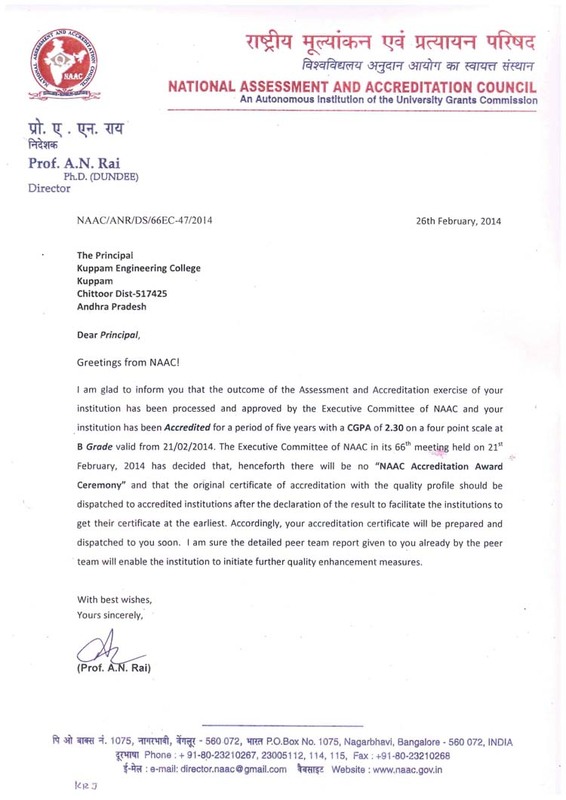 KEC has received the accreditation from UGC’s National Assessment and Accreditation Council (NAAC). Mou with MOSCOW AVIATION INSTITUTE,RUSSIA. Recognition of University Grants Commission under 2(f) & 12(B). Received Rs.2.87 Crores Grant for Project sponsored by NSTEDB Department of Sciences & Technology, Govt. of India.